I was told that I would be helping to support the amazing Julie Atherton (Name dropping!) for her album launch, only a few days before the event, so emergency eyelashes had to be bought as my other ones had been misplaced. When seeing all the different lashes in front of me I must admit I was overwhelmed. After staring at the selection for a good five minutes, having workers and people giving me odd looks, I just picked up the pair that I thought would fit. I have been wearing lashes now for a number of years, but I still hesitate at the eyelash isle, never knowing what to grab. The packaging is pretty standard for all lashes, the lashes stuck lightly to a sticky film and there's a little slot for adhesive. I've always loved the Eylure adhesive and I've never found to have any problems. To apply my lashes I always use tweezers (Unless I'm feeling outrageous, but instantly regret it after application), I use Tweezerman's, but any tweezers will do the job - No need for the special 'Lash Tweezers' unless you feel like you'd get comfort in that. 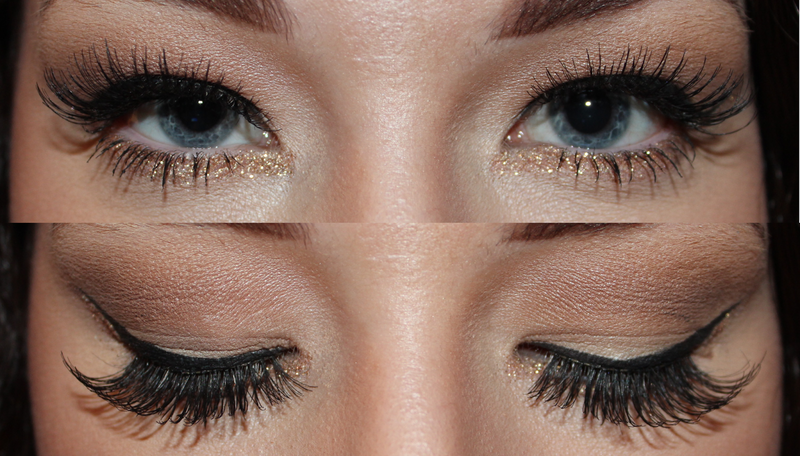 I then match them to my eye - I always need to cut off about 4 lashes to fit my dinky eyes. I then apply a thin layer of glue, wait to go tacky for about a minute, then apply. I usually wait about 3 minutes after application to apply any more makeup, such as mascara. I always put lashes on last, but it's a preference. These lashes are perfect for a good amount of length and volume, I feel these aren't too 'heavy' on the face, and suit the makeup and occasion well. I wouldn't wear these daily, as these aren't ideal for an every day look, but if you're looking for a good set of lashes that will look perfect for any evening look, the Eylure 155's are the way forward. What are you favourite Eylure lashes? Grab these from Boots for £5.39. Ahwww thank you! :) Have a look for them! Hey! Just stopping by because I did the linkup, which I found through Sunday Blog Share, and I am obviously a bit out of my depth! Should have looked more closely before I joined, I think! Ah, well, live & learn. Nice use of the art here, I must say! Wowza! Those are INTENSE! Love them!! These are a bit gorgeous! I keep seeing them on the counter at Boots but I have zero confidence in my ability to get them stuck to my eyelids correctly! Yours look amazing though!